Catalogue of Egyptian antiquities: found by Prof. Flinders Petrie and students at Hawara, Gerzeh, Mazghuneh and Memphis, 1911 ; exhibited at University College, Gower St., London, June 26 - July 29 / British School of Archaeology in Egypt. 1911. London : BSAE. Petrie, W. M. Flinders 1889. Hawara, Biahmu and Arsinoe. London: Field & Tuer. Petrie, W. M. Flinders 1911. Roman portraits and Memphis (IV). British School of Archaeology in Egypt and Egyptian Research Account  (17th year). London: School of Archaeology in Egypt; Bernard Quaritch. Petrie, W. M. Flinders 1913. The Hawara portfolio: paintings of the Roman age. British School of Archaeology in Egypt and Egyptian Research Account  (19th year). 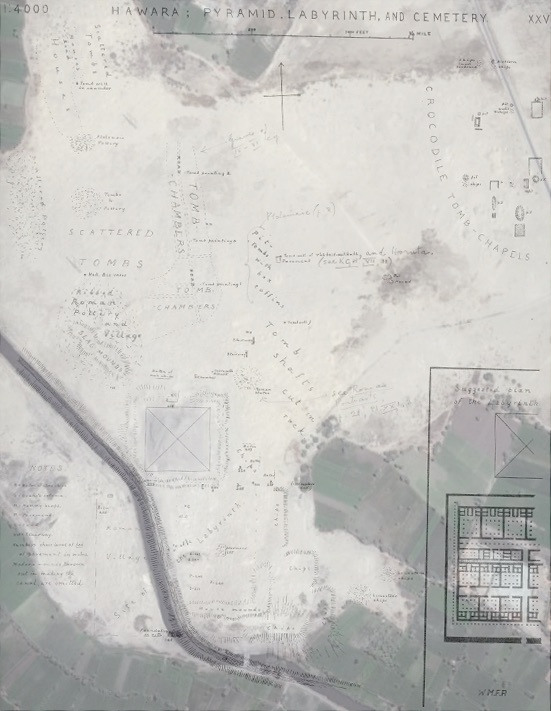 London: School of Archaeology in Egypt; Bernard Quaritch. Quirke, Stephen 2007. The day-to-day pocket diaries from Petrie's seasons at Hawara, 1888 and 1910-11. In Picton, Janet, Stephen Quirke, and Paul C. Roberts (eds), Living images: Egyptian funerary portraits in the Petrie Museum, 105-110. Walnut Creek, CA: Left Coast Press.